Looking for a little adventure in your life? 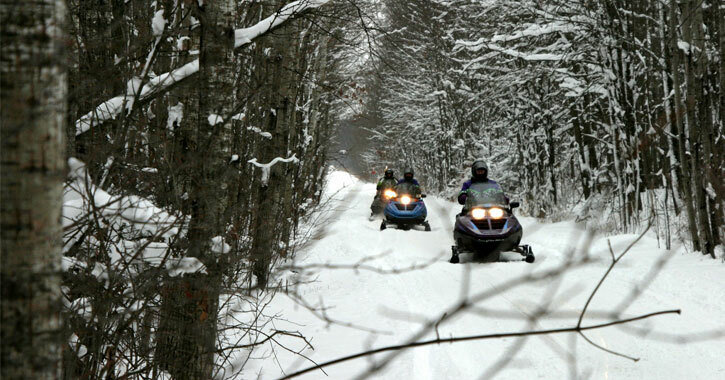 Then take advantage of the snowmobile trails in the Saratoga area and experience a thrilling ride! With miles of groomed trails, you're sure to enjoy a few hours or a full day of exciting snowmobiling action. The snowmobile trails in Saratoga also offer the option to connect to other trail systems that can take you to Lake George and even into the Adirondacks. You'll find miles of interconnecting snowmobile trails, both groomed and ungroomed, in the following maps in Saratoga and the surrounding counties. Please note: Each trail has a different opening date based on the hunting season in that area. By mid-December, all trails will be open for use only if snow conditions allow for snowmobiling. It's advised to contact snowmobile clubs ahead of time to check on the current conditions. Find snowmobile trails in Saratoga, Ballson Spa, and Duanseburg. Find snowmobile trails in Schroon Lake, Port Henry, Saranac Lake, and Minerva. Find snowmobile trails in Saranac Lake, Lake Placid, Lake Clear, St. Regis, and Tupper Lake. Hamilton County is considered the snowmobile capital! This area has over 700 miles of interconnecting snowmible trail systems between Moose River Plains, Indian Lake, Inlet, and Long Lake. You can find over 100 miles of trails in Lake George, Lake Luzerne, Queensbury, and Glens Falls. Most of these trails are groomed nightly during the season. More than 80% of the snowmobile trails in Washington County are on private land. It is due to the generosity of these landowners that these trails exist! These trails are in the towns of Whitehall, Hampton, Fort Ann, Granville, and Greenwich. Again, you'll want to contact the appropriate snowmobile club to find out current weather conditions for the trails you're looking to explore, or for any further information on snowmobling in the area. When you've decided where you'd like to go, visit SnowmobileTrail.com for a map in which you can zoom in and see where the trails are. If you'd prefer to use a physical map, you can request one for free through the Adirondack Regional Tourism Council.